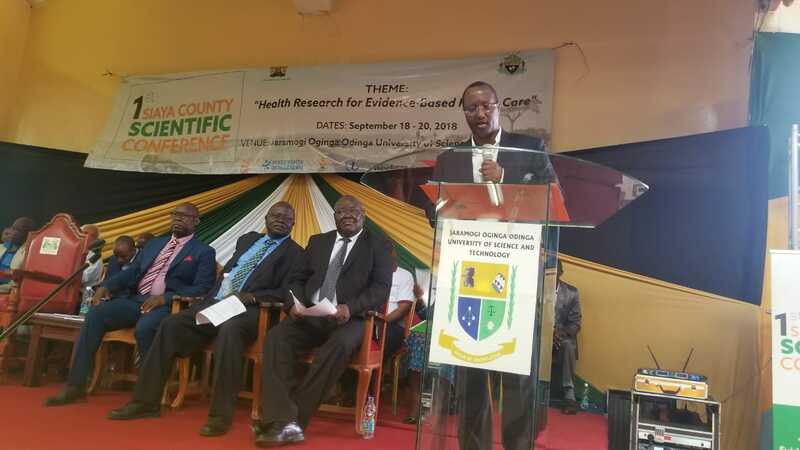 The inaugural three day Siaya Scientific Conference on Health has been officially opened by His Excellency Dr. Mohammed Kuti, Isiolo Governor. 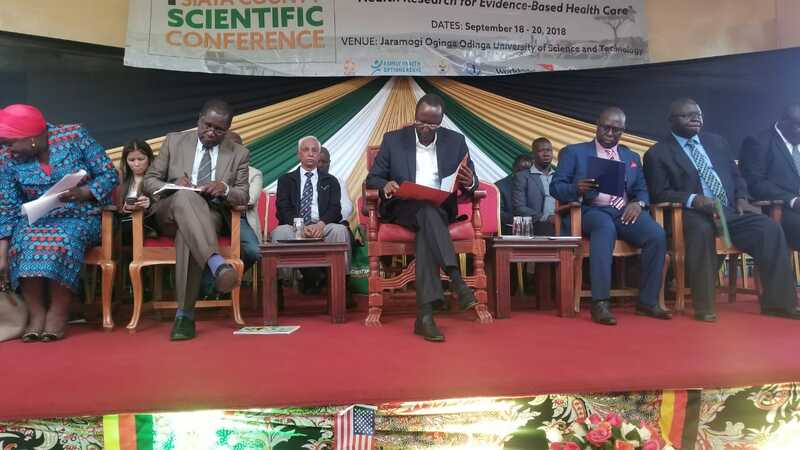 The conference happening at Jaramogi Oginga Odinga University of Science and Technology has brought together professionals and academia from across the region with interest in health research to inform action. Themed “Health Research for Evidence-Based Health Care in a Devolved System”, the conference seeks to discuss over 150 abstracts from different participants on health care broadly. His Excellency Dr. Kuti who doubles up as The Chairman of The Health Committee at The Council of Governors in his opening remarks enumerated the progress made by the Governors Council in promoting research in health. In 2012, for example, there were 874 doctors and 6,620 nurses in the entire Country. Currently, there are over 4,080 doctors working at County facilities and 557 doctors at national referral facilities making a growing total of over 4,637 doctors according to the Governor. His Excellency noted the need for research in the areas of how these improvement in the staffing capacity has improved health services within counties. Though the distribution of health care workers across the country has not attained global standards, the Governor indicated that the current status of health care workers distribution is an improvement from the previous era when health was a function of the National Government. Siaya Deputy Governor Dr. James Okumbe who welcomed the Isiolo Governor noted that through partnerships with various organizations including PATH, CDC, CHS, World Vision, KMET, PEPFAR among others, the Siaya Government have seen increased infrastructure development in the health sector, increased engagement of community health volunteers popularly known as ‘nyamrerwa’ to deepen access to health services and better staffing within Siaya health facilities since devolution began. According to Siaya County Executive Member for Health Hon. Dorothy Owino, universal access to health care will be Siaya County’s flagship in the 2018/2022 County Integrated Plan with the first 14,000 new recruits targeted in 2018/2019 finacial year. A bill is at the drafting stages for processing by the Siaya Assembly to actualize the universal healthcare idea. Dr. Kamah Rogo, a renown world bank health consultant who traces his roots in Siaya County, Gem Sub County, who gave the key note address emphasized to the participants that attitude and not funds is the main problem in the health care management cycle. Dr. Kamah decried the fact that with the large number of professionals in health and other disciplines per square kilometer in Siaya County, our health indicators are still almost similar to those in Isiolo with all it’s challenges. That technology and use of specialized data is the future of healthcare with phones as opportunities for access to universal healthcare funding was another of Dr. Rogo’s prophecy. He urged the County to invite professionals back to the County to provide care and support in the health sector. 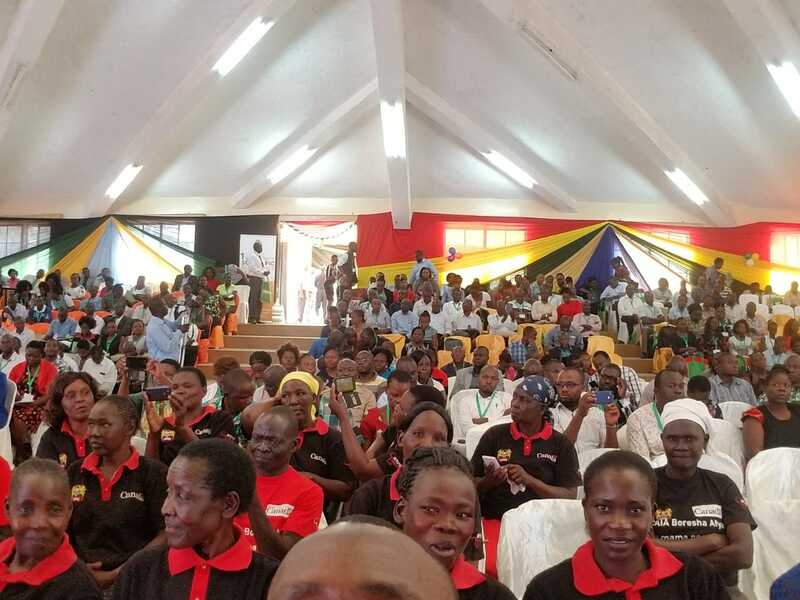 The conference which will run for the next three days has been supported by the County Government of Siaya and its partners in the health sector and is bound to break new ground in the science of health countrywide.